Mrs. Ruth Adisetu Pobee was born on 6th March 1978. She obtained her B.Sc. degree in Nutrition and Food Science (2002) and the MPhil degree in Nutrition (2006) from the University of Ghana, Legon. She is a Nutritionist and a Research Scientist with the Food Research Institute of the Council for Scientific and Industrial Research (Ghana). 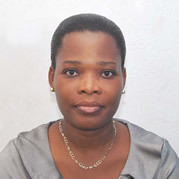 Mrs. Pobee’s research interest is in the area of maternal and child nutrition, micronutrient deficiencies among children, community-based nutrition assessments studies and nutrition advocacy programs. Over the years she has championed the course of nutrition through media house interviews, call-in sections and presentations on different radio stations in Accra, Ghana. She writes in a popular Ghanaian magazine titled: “Pregnancy and Beyond”. Her advocacy programs span across youth groups, community women groups and church organizations. She has won three prestigious awards one of which is the Norman Borlaug Fellowship Program (Feed the Future Fellowship) which she is currently undertaking at the Penn State University (USA). Her research topic for this program is the use of local rice, orange-fleshed sweet potato and cowpea to develop a weaning formula; as well as to estimate the bioavailability of iron in this food using the Caco-2 cell model. Her passion is to make an impact on the socioeconomic development and the nutritional well-being of her immediate society and the world at large. Mrs. Ruth Adisetu Pobee is married to Leslie Sowah Pobee and has two sons, Leslie (Jr.) and Nathanael. Mr. Nicky Odhiambo Okeyo, is a Applied Statistician who earned his degree (Bsc) in Maseno university, a computer science (PGDip) certificate from Maseno University and a masters degree in community Health and Development from Great Lakes University. My master’s research focused on the Infant and young Child feeding practices in rural community. He has rich working experience in community tapping local community resources for health empowerment and development. He has a wealth of statistics teaching experience having taught statistics at both Great Lakes University and Maseno University. He has strong project leadership, management and collaborative research experience having coordinated an international multi-country study funded by international Development Research Centre(IDRC) through the School of Nursingat the University of Ottawa. In Feb 2011 he joined KEMRI as a project lead on strengthening data systems at the Jaramogi Oginga Odinga Teaching and Referral Hospital (JOOTRH) HIV clinics. He led at team of software developers and data managers in the implementation of Open MRS system at JOOTRH and strengthening the monitoring and evaluation system for the HIV care services at the hospital. He is also a consultant with Herald consultants as a program evaluation data consultant. He has authored one paper and co-authored three other research papers. 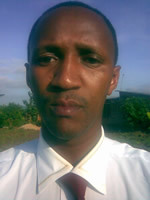 Deusdedit Peter Mlay (PhD) is a soil scientist (soil fertility) working as Principal Agricultural Research Officer with the Lake Zone Agricultural Research and Development Institute, Mwanza, Tanzania since 2003. He is charged with conducting research on soil health and recommends the appropriate fertilizer application rate packages for various crops grown in the Lake Zone. In collaboration with other researchers and international institutes, he has accomplished various research tasks like: Improving the livelihood of African smaller holder farmers by scaling up the production of cassava material through the adaptation of low-cost biotechnology techniques developed by International Centre for Tropical Agriculture (CIAT) in 2007, Cassava tropical whitefly project Tanzania (2005 to 2008) funded by International centre for tropical agriculture (IITA) and appointed by Plan International South Sudan as Consultant in Assessing Agricultural and Livestock potentials in Central Equitoria and Jonglei States in South Sudan (January 2013). He has attended several international scientific conferences among the Second Scientific Conference of the Global Cassava Partnership for the 21st Century held from 18th to 22nd June, 2012 at the Speke Resort and Conference Centre, Kampala, Uganda where he presented a paper on: “Cassava-legume intercropping: A strategy to the better cassava crop performance”.